The University of Toronto produces gatherings on a regular basis called ArtSci Salons (reminiscent of salons held in Italy and France in the 18th and 19th centuries), where artists and scientists meet to discuss topics related to the intersection of art, science and technology. 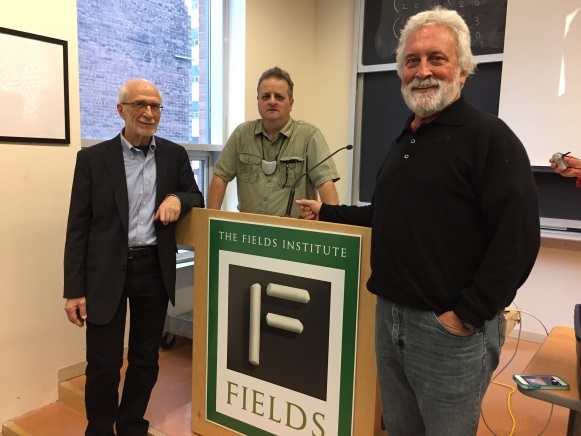 The ArtSci Salon group hooked up with the music faculty for a three-day symposium titled “Reich, Rhythm and Repetition: Patterns in Music, Speech and Science,” sponsored by the Jackman Humanities Institute’s 2016-17 Program for the Arts and hosted by the Fields Institute for Research in Mathematical Sciences. This included many talks and a few performances by the group I play with, NEXUS. I was one of the presenters for several events, sharing the stage with physicist Dr. Stephen Morris. The audience was primarily made up of students and faculty but the general public was also invited. We did two afternoon sessions together in which we demonstrated principles of both sight and sound. I presented an instrument I invented called the Vistaphone, which is made up of 32 tubes and rods tuned to the natural overtone series. While this “scale” is something that you’ll find in both music theory and physics books, it is surprisingly uncommon to be able to hear it. The scale is made up of one frequency called the fundamental and overtones in the relationship of whole numbers above the fundamental frequency. No one attending this event had ever heard an acoustic realization of the natural harmonic overtone series in this manner. 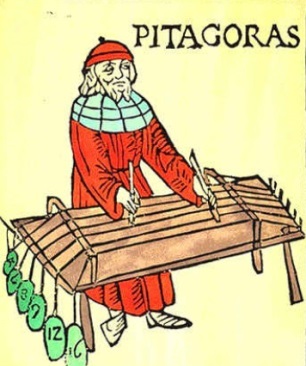 These relationships of musical frequencies were known to the ancient philosopher and mathematician, Pythagoras, who demonstrated them on a single-stringed instrument called the monochord. Through the use of a custom software program, I also demonstrated how slow rhythmic pulses when sped up become audible pitches. When two pulses related by whole number ratios are sped up, the associated interval is heard. Here is an audio example of me playing 3 pulses against 2 pulses, and then speeding that polyrhythm up until you hear the musical interval we call a perfect fifth in Western music. Stephen Morris illustrated some fantastic acoustic and physical principles in his session entitled “Making Sound Visible.” Nineteenth century physicist Ernst Chladni invented a method of visualizing the vibration of plates by sprinkling powder on them, which led to several advances in both mathematics and acoustics. To illustrate this phenomenon, Stephen made a flat metal plate vibrate at various speeds, causing salt sprinkled on the plate to form amazing patterns. The salt moved to the places where the least amount of vibration occurred (the nodes). When the vibrational frequency was changed, the patterns changed, which seemed like magic. Another fascinating demonstration of Stephen’s had to do with pendulum motion. The device he used consisted of a number of balls of different weights suspended by strings of various lengths, swinging at certain frequencies. The proportions of the weights he chose resulted in a series of changing motions, and the pattern was repeated every two minutes. He cited a piece that Steve Reich wrote called Pendulum Music (1968, 1973) that makes sound visual, so to speak. 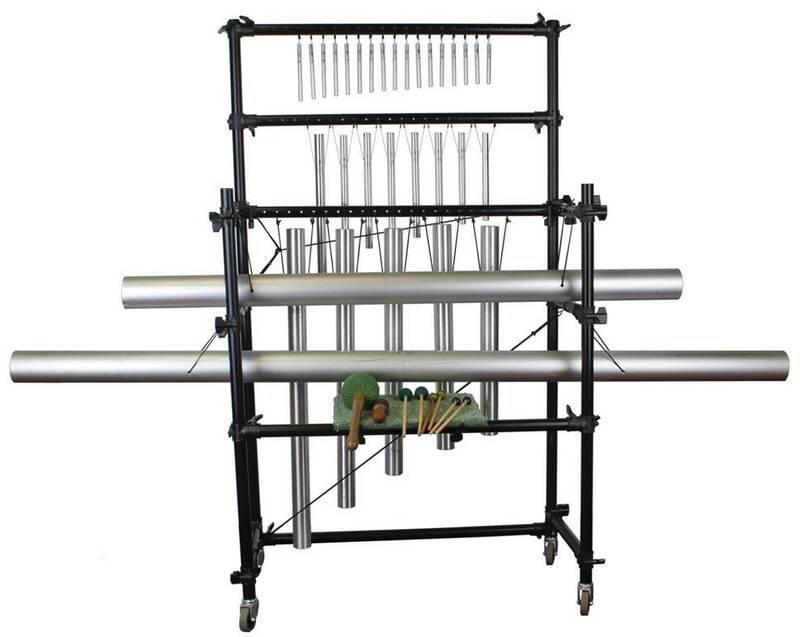 The next day, my workshop focused on instruments I built and a performance of my arrangement of Steve Reich’s Piano Phase, which I play on another of my inventions, the Reichphone, and call Mallet Phase. Dr. Morris explained icicle formation and demonstrated how patterns are created by dripping syrup on a belt moving at various speeds. Dr. Morris is perhaps best known for his YouTube video of the Domino Chain Reaction, which will blow your mind! Russell Hartenberger of NEXUS, along with Kathy Armstrong and other members of NEXUS, presented a workshop entitled “The Use of Rhythmic Patterns in West African Drumming and the Music of Steve Reich,” which included performances of the music of Moondog, Hartenberger and Reich. Remember the three types of people I mentioned at the beginning? Perhaps the third type is one who is fascinated by music and science and will bring back the excitement of interdisciplinary discovery. I hope this inspires you to be one of those!